This all started in August 2010 when we discovered that a rat had eaten gaping holes in the outlet hose of our dishwasher. When all the damage was counted, we were looking at a complete remodel of our kitchen area, covered in part by our homeowner’s policy. Eventually this led to a complete energy revamp of our home, and, very pleasingly, a dramatic drop in our electrical bill—from roughly $400 per month on average in 2008 to roughly $60 per month in 2012 (even including the cost of a swimming pool filter pump, which must run five hours per day, 365 days per year). While planning the kitchen remodel work, we asked our electrician if LED lights were available for the ceiling cans. He said no, because our ceiling is slanted. However, on the day he came to do the electrical work, he said that there were some LED fixtures now available. So we told him to install them. We were not disappointed. 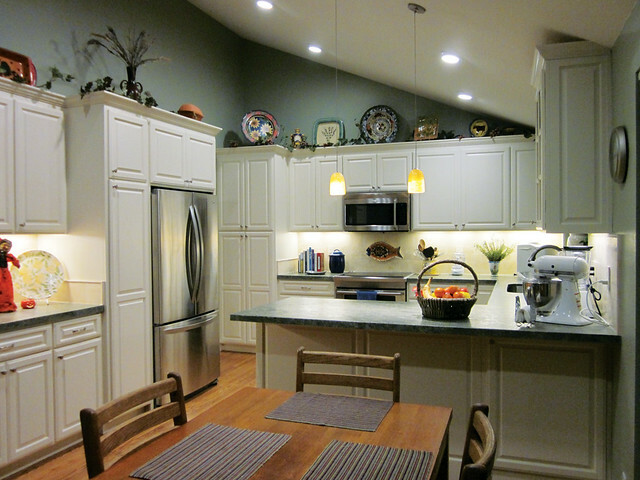 These LED lights (Cree LE6C-GU24) fit into a standard 6-inch ceiling can, connect using a fluorescent socket (now required for major kitchen work in California), are dimmable, give a very bright, true-white light, and yet use only 12 watts. They are easily the equivalent of 100W floodlights. 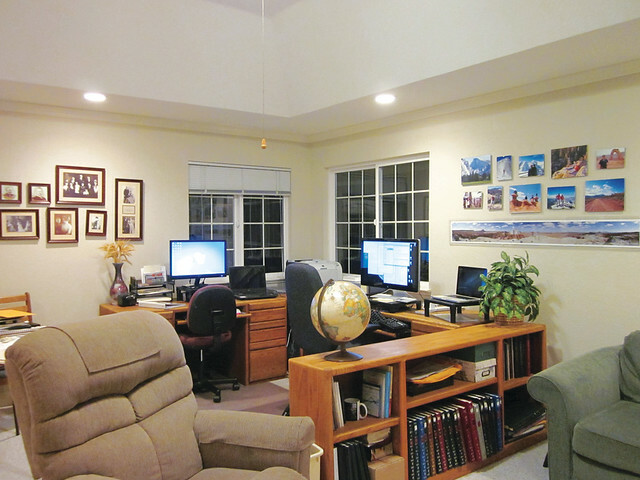 Lighting in the den is provided by six 9.5W EcoSmart LED ceiling cans, plus four 7W LED light bulbs in the ceiling fan. Greatly encouraged by this, we started to wonder what other lights in our home we could replace with LEDs. I soon found some newly available can lights at our nearby Home Depot: EcoSmart 9.5W downlights (model EC0575L). These are very attractive looking, emit a pleasing warm white color (2,700°K), include a self-contained white exterior ring, and feature a standard end, so that they screw directly into existing fixtures designed for conventional incandescent can lights. They currently sell for $39.95 at Home Depot stores. While we winced considerably at the steep price, we were so pleased with the first set of lights we purchased that we eventually replaced all the remaining can lights in the house—some 29 lights in total—with these EcoSmarts. I might add that they are now available at discount from online retailers such as Amazon.com, particularly if one orders in bulk. We then vowed to replace all (or almost all) of the remaining lights in the home with LED bulbs. We first found that there are some very nice replacements available for standard 70W lightbulbs, namely the EcoSmart GP19 bulb (model #ECS19WW120), also available at Home Depot. This bulb is listed as using 8.6 watts, although when I measure it with a wattage meter it uses only 7 watts. Also, although the bulb is billed as a “40-watt equivalent” (430 lumens), we have found these to be equivalent to 70W bulbs, evidently because more light is directed upward rather than to the side. For this reason, these bulbs are particularly effective as replacements for the lights in ceiling fans (we have six fans with a total of 21 lights in our home). Their light (3,000°K) is somewhat bluer than the can lights we had installed, but is still entirely acceptable. We also have three bathrooms with vanities featuring spherical bulbs—26 bulbs in total. Alas, we could not find any good LED equivalents at Home Depot or other nearby hardware stores. However, we did find an excellent replacement from Amazon.com: a General Electric model 76464 Energy Smart LED Globe Light Bulb. It uses only 2.8 watts, yet it gives light output comparable to a 30W vanity bulb. After I replaced these in three bathrooms, my wife and daughters could not tell any difference. Another choice here is Lights of America model 2035LED-30K-8, which gives a brighter, warmer light. 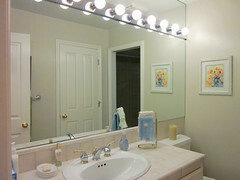 Lighting in bathrooms is provided by a series of 2.8W General Electric vanity bulbs. One final application was our bedroom reading lights. We found that the EcoSmart GP19 bulbs just aren’t bright enough here. However, the EcoSmart A19 LED bulb fits the bill just fine. It uses 13 watts, emits 3,000°K light, and although it is rated as a 60-watt equivalent (850 lumens), we find it to be equivalent to a 100–150W bulb. In general, we are very pleased with the outcome—we have brighter, cheerier, and definitely more attractive lighting than before (which is a most important factor in selling LED lighting to the public). And every month our superlow electrical bill reminds us of how much energy we are saving. The other advantage is reliability—in the two years since we installed these lights (nearly 100 in total), only one, a bathroom vanity bulb, has failed. This very high level of reliability is in itself worth the extra purchase price to us. - David H. Bailey is a senior scientist at Lawrence Berkeley National Laboratory.